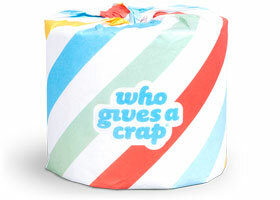 Who gives a crap is all about giving a crap when you squat to take a crap… 50% of the profits are used to build toilets where there are none. Think about all the developing countries where people don’t have plumbing, sewers or toilets. 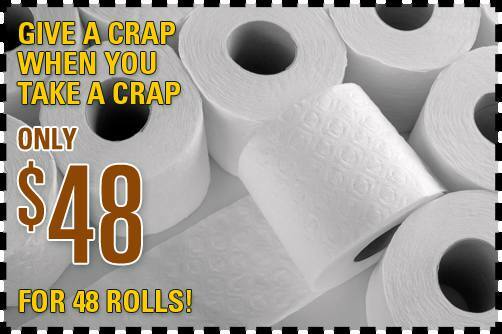 You can help change that – one roll at a time! It all starts as soon as you wipe yourself with a Who gives a crap toilet paper. We know many people do give a crap and want to do something for those less privileged. Did you know that 40% of the world’s population has no access to a toilet? Diarrhoea-related illnesses kill over 2,000 children under 5 EVERY SINGLE DAY. Who gives a crap toilet paper is also good for the environment. This paper uses 100% recycled fibres so you can wipe yourself without wiping out a small forest somewhere in the world. It’s good for your bum and good for the earth! Globally, the equivalent of 27,000 trees is flushed down the crapper every day from toilet paper! Creates 5 times more jobs than one tonne of paper products made from virgin wood pulp? So the next time you take a crap, please give a crap and only use toilet paper that is good for your bum and the environment. Together we can make a difference. One roll at a time. It can all start the next time you visit the toilet. C’mon, it’s time to give a crap when you take a crap!